NYC, 04/23/2019, 2:00PM. 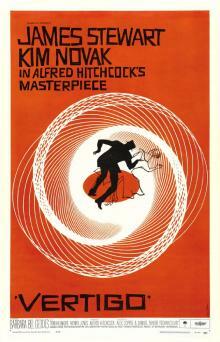 Vertigo (1958): Two Time Oscar Nominated Psychological Thriller By Alfred Hitchcock. 128 min. Director: Alfred Hitchcock. Starring James Stewart, Kim Novak, Barbara Bel Geddes. Vertigo has two Academy Award nominations for Best Art Dircetion and Best Sound. The movie replaced Citizen Kane (1941) as the greatest film ever made, in the 2012 British Film Institute's Sight & Sound critics' poll. It has appeared repeatedly in polls of the best films by the American Film Institute, including a 2007 ranking as the ninth-greatest American movie of all time.